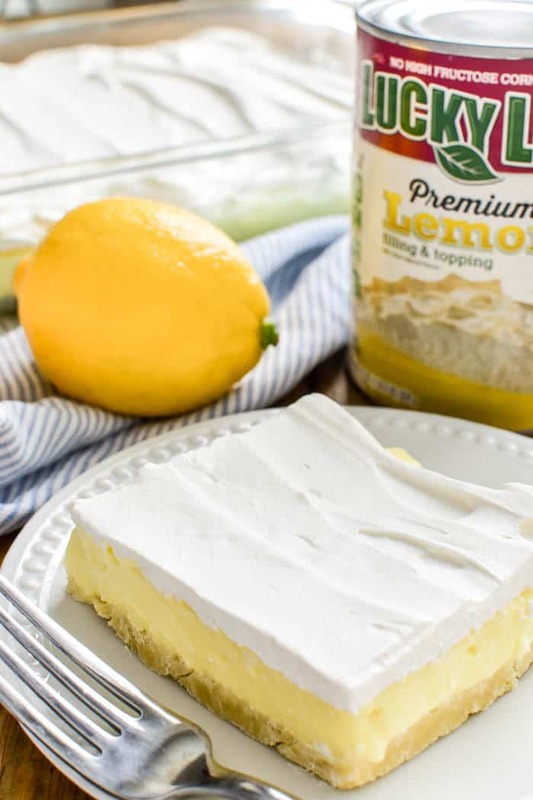 Layers of Lemony Love is a deliciously creamy lemon dessert that’s perfect for spring! This easy dessert starts with a simple shortbread crust topped with sweet lemon cheesecake and creamy whipped topping. It’s ideal for summer parties, picnics, or baby showers….and always a crowd favorite. If you love lemon, this is a must make recipe! So. Who’s ready for spring? I know I am…and I have been for months now! And yet. It just. keeps. snowing. We’re currently getting snow on top of snow on top of ice. The kids are hoping for a snow day and Jorden is out shoveling again and the last two weeks of soccer have been canceled. And…oh yeah. It’s April 18th. This weather is total insanity! Tell me it’s better where you are. Or don’t…I may be jealous. The only good news? Once spring finally gets here we’ll all be really ready for it. And in the mean time? We can pretend it’s warm outside by making ALL the lemon desserts. Sound like a plan? There’s just something about lemon that feels happy. And warm. And springy. Maybe it’s the color….like sunshine….or maybe it’s the bright, refreshing taste. 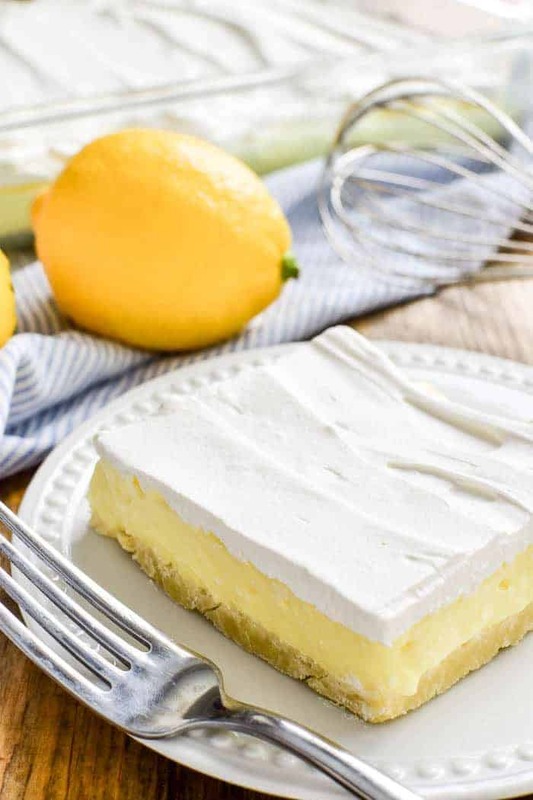 Whatever it is, when it comes to desserts you want to make all spring and summer long, lemon is always at the top of the list. Right now we’re particularly obsessed with Lemon Mousse and Lemon Poppy Seed Cupcakes and this Layers of Lemony Love dessert. Because layers. And lemon! What’s not to love!? 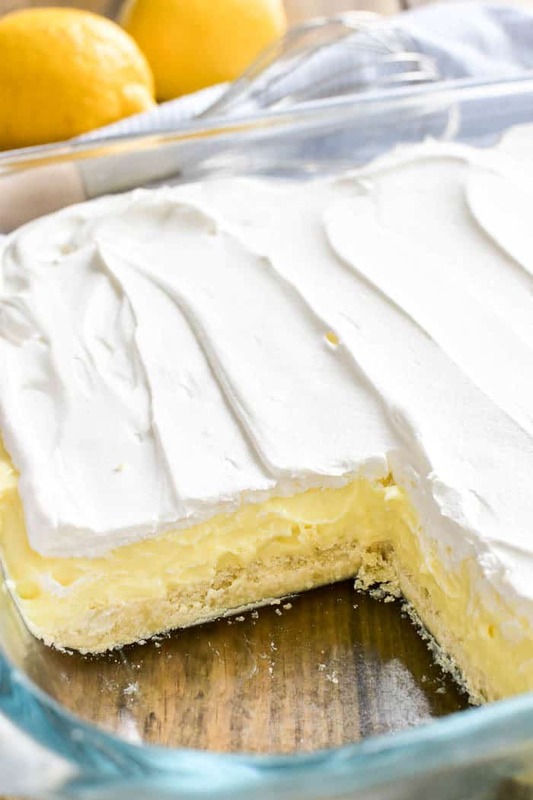 Between the shortbread crust and the creamy lemon cheesecake filling and the whipped topping to finish it off…this is one lemon dessert you can’t help but be obsessed with. Lucky Leaf Fruit Fillings are convenient, easy to use, and contain no high fructose corn syrup! Not only is it creamy and dreamy and delicious….but it’s also SO easy to make! And it’s made with Lucky Leaf Fruit Filling, which is my family’s favorite. Lucky Leaf Fruit Fillings are super convenient and easy to use, and I love that they’re made with no high fructose corn syrup. I’ve used them in a bunch of recipes, like my Cherry Cheesecake Lush Dessert, Blueberry Pie Bars, Baked Caramel Apple Cheesecake Dip, and Cherry Cheesecake Gingerbread Trifle. And when I found this recipe for Layers of Lemony Love in the Lucky Leaf e-recipe book Just Desserts? I knew I had to make it. And now that we’ve tried it (and loved it) you better believe I’ll be trying even more of them. This e-book features 20 easy dessert recipes that are all made with Lucky Leaf Fruit Filling, and it’s available for free download! So even though it may not feel quite like spring, at least we have desserts to make us happy while we wait. I hope you enjoy this yummy lemon dessert as much as we did! 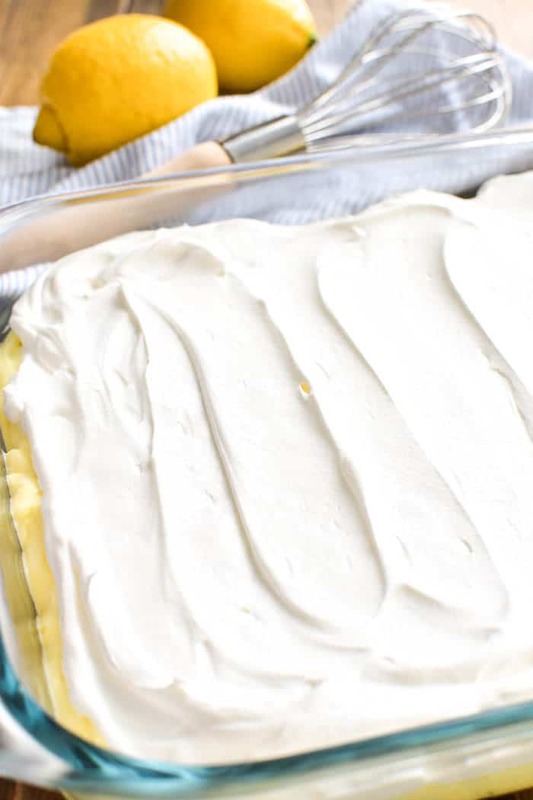 Layers of Lemony Love is a deliciously creamy lemon dessert that’s perfect for spring! This easy dessert starts with a simple shortbread crust topped with sweet lemon cheesecake and creamy whipped topping. It’s ideal for summer parties, picnics, or baby showers….and always a crowd favorite. If you love lemon, this is a must make recipe! Preheat oven to 350°F. Grease bottom of a 9 x 13-inch baking pan. Mix flour and butter; spread in pan. Bake for 20-25 minutes or until golden. Let crust cool. Mix cream cheese, powdered sugar, LUCKY LEAF Premium Lemon Pie Filling, vanilla and half of the whipped topping together. Spread over crust. Spread remaining whipped topping over pie filling mixture. This looks so light & tasty! I LOVE lemon desserts! Can’t wait to take a bite of all those yummy layers! Looks fantastic! I love lemon desserts! So light and delicious! We have been enjoying these for breakfast and dessert. Love the flavor! Lemon desserts are seriously the BEST!! Like you, I am SO ready for this winter-spring to be over! I love this! Such a refreshing dessert for summer! I love Lucky Leaf pie filling!! 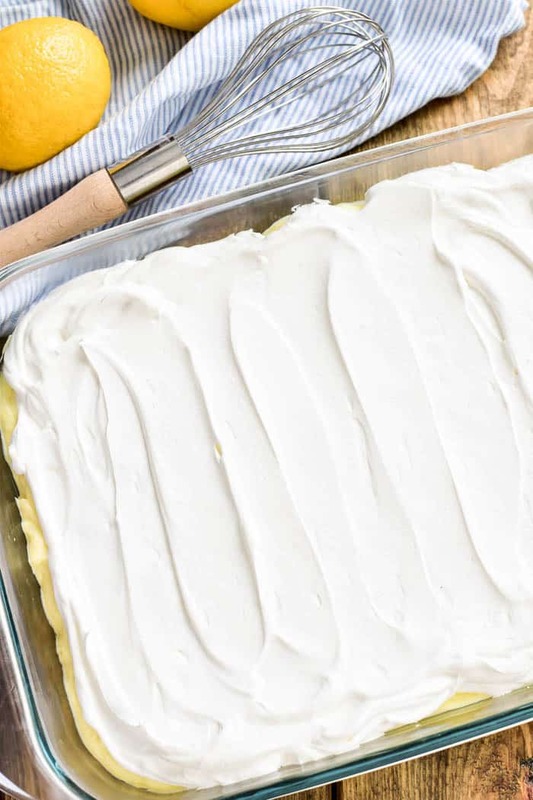 I see this lemony dessert happening at my house in the very near future!! i’m all about everything lemon right now! looks so refreshing! Just made this today…. yummy… I will be keeping this recipe .